It looks deelicious! I'd eat it in a second, whipped cream or not. Now I feel the need to make a light, fresh cake like yours. Thanks for your help the other time with the translation. I have always been searching for a very simple and yet "powerful" chiffon cake receipe. Is it possible to get the receipe from you? Chiffon cakes are my favorites and yours looks delicious! As Chronicles of Chaos, I would like to try this recipe too. My mail is akemi67@gmail.com, onegai shimasu! Next time you might try lining your cake tin with silicone release paper - parchment paper, which might give you a smoother finish. I love how the "rough" edges look, actually, it makes me want to eat it all the more! I looks delicious! Could you please post the recipe? Thanks. This was indeed light and airy :) I have to confess that it didn’t take me long to finish it. I tried to email you the recipe, but it failed. Can you email me at the address in my profile? Thanks. Really? That’s a dangerous effect. :D In fact, I'm thinking about buying what they call "chiffon knife" here so that I can remove the cake from the pan easily and beautifully. Unfortunately I don’t remember the title of the cookbook or the author, so I’d rather not post the translation of the recipe, because I can’t give it a proper credit. Can you email me at the email address in my profile? Your lime chiffon cake looks so gorgeous. Could I ask you to email me the recipe too? Thanks. You might want to spell out your email address like “xxxxxx at hotmail dot com” to protect it from email harvesting robots. I've always loved yr site and as always yr photos are amazing. Would you be kind enough to email me yr recipe? Thank you so much, and sorry I didn't make it clear. The xxxxxxx part in my example needs to be replaced with whatever there is in front of the @ mark in your email address. Can you give me your address again, please? 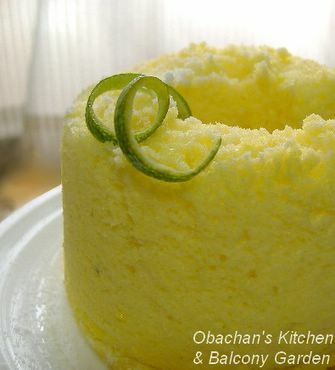 Can you please share your recipe of Lime Chiffon Cake? Chiffon cakes release very easily when the bottom is lined with wax paper or parchment paper. Never grease or flour the sides of thepan. When the cake has sufficiently cooled, run an ordinary kitchen knefe around the sides and tube. Place a plate on top of pan. Hit the bottom of the pan and the cake should release. Remove the wax or parchment paper and turn the cake right side up. May I have a copy of this recipe please? How can I contact you? Also, recently, I was in Japan and had the most delicious cherry blossom chiffon cake bought from the store. I am not sure if it is baked or steamed. Do you have the recipe for the cherry blossom chiffon cake as well? your lime chiffon cake looks so nice. Can you send me your recipe :D? I also want to know the book name too.